Do you like buttons? Buttons with different textures? Buttons that are still buttons for redstone circuits but are also BIG? This mod has the same 200+ buttons that my other mod More Beautiful Buttons has, only they now use the BIGGER BLOCK model from OpenBlocks! To use the buttons click right in the center of them, this is going to be fixed shortly. Increase the size of the Bounding Box to include all of the textured part of the now larger block model. Import more needed classes from the OpenMods library. You don't need my permission. Add it and enjoy! While not required, a link back would be greatly appreciated. Other than the obvious methods provided by Curse. You can also chat with me live on Discord and Twitch at the following. The servers are public. I am Veteran of United States Army. I am not disabled. But I do love to make these mods and modpacks for you guys. Please help me to help you by Donating at https://patreon.com/kreezxil&nbsp; . This project is proudly powered by FORGE, without whom it would not be possible.Help FORGE get rid of Adfocus at https://www.patreon.com/LexManos. Hmm, is it possible to make the button size extend to the full block? that's possible but then it would be very obvious that a button was on that block if the surrounding blocks are of the same texture. Could you possibly add mod support? What do you mean add mod support? As in add different buttons and pressure plates (for each of your respective mods) when a certain mod is installed. For example, maybe you could add Midori buttons when Quark is installed, or Topaz buttons when Biomes O' Plenty is installed. You don't have have to add it in but it would be an interesting addition. Now that I know what you meant. I'll see what I can do about making the mod more dynamic so that it can make buttons out of any block texture. it's going to take me a bit. i'm researching the algorithms and methods needed to make it happen. 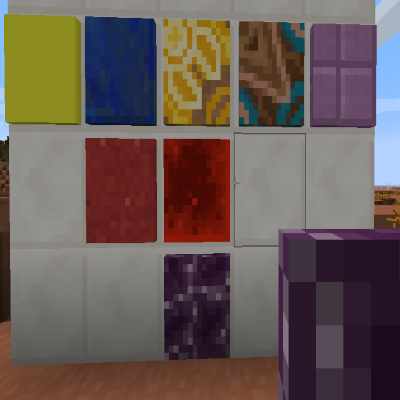 Once completed it'll allow you to make a button or plate out of any full block texture from any mod without my knowing in advance what that other mod is. As an update, I'm still working on the dynamic aspect of this. I have some code fragments to consider now. The current thought is that when I pull this off, I'll release a new mod that contains all the capabilities of my more ... mods in it, it'll use a machine to fabricate the new item, and transpose the texture and properties from one to the other. Ultimately the mods will be smaller in size as I'll no longer need the static models and blockstates. The complexity in the code will go way up tho and that's the part that's slowing me way down right now. Also the recipes will be come simpler. So for the player this will be a boon by a factor of 2. I have no ETA on when I might accomplish this. But I am literally foaming at the mouth about it. Because it has the capability to be very awesome.